Viktoria De’Ann is a technologically based company that synthesizes in a FDA inspected laboratory its own unique Peptide Messengers that are administered transdermally. 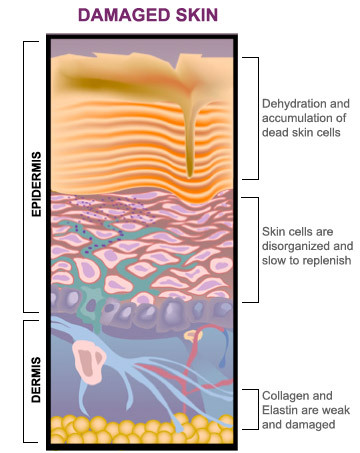 Optimizing the cells in growth areas of the skin (dermis and epidermis) allows for an internal re-establishment of the Natural Healthy Cell Cycle. As these supporting layers of the skin peak towards their natural operating function the affects can be seen in the subsequent outer layers through corrective balanced exfoliation, skin health, and visible skin beauty. As skin ages it loses the message to replenish itself at the proper rate. 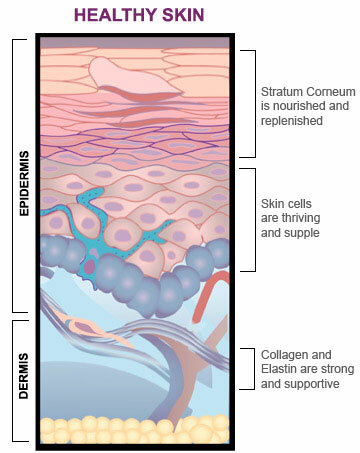 Damage from the environment slows cell turnover rate, causing the dead cells on the surface (stratum corneum) to accumulate and become thicker reducing moisture, nourishment, and protection from within, producing rough unhealthy skin. The ultra violet (UV) rays from the sun, increase pigmentation and damage to skin cells, resulting in age spots and freckles. Collagen and elastin,which is the structure that holds the skin together, start to break down causing it to lose its firmness and resilience. Peptides allow the skin’s cellular function and skin renewal cycle to become optimized and renewed, which replaces the upper thick dead skin cells. Rejuvenation of the dermis helps to renew and smooth the skin’s surface. Renewal of the stratum corneum also helps reduce the appearance of uneven pigmentation and freckles, while healthy Collagen and Elastin promote firm, youthful skin.